Each month, The Wrap Up asks one of today's finest bass music producers to put together a mix for all of you 140 BPM virgins and lovers of bass out there. After we were blessed with Preditah’s grime-led 'Future Sounds' mix last month, we thought it was time to explore the 10-year-old genre a little further. 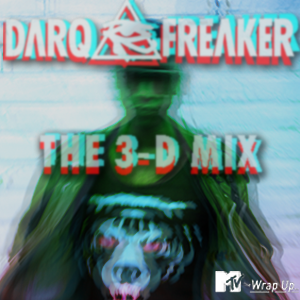 So, please welcome south London's Darq E Freaker to the MTV stage. The producer behind Tempa T's smash hit, 'Next Hype', has created an exclusive 14-track mix that will take you into a new dimension of instrumental grime music in 2012. Darq E Freaker: My name is Darq E Freaker and I’m the producer behind Tempa T's legendary club anthem, 'Next Hype', and various over grime music monstrosities. I titled my MTV mix 'The 3-D Mix' because I hear a lot music in this grime/bass/wonky/dubstep/140 BPM hybrid genre of ours and it just sounds very 2-D, plain and basic to me. I wanted the beats to really come out and for people to feel them as they've never felt 140 BPM before. It’s my mission for the listener to experience the euphoria I work to create whilst they embark upon this musical journey. TWU: Is instrumental grime taking over? Darq E Freaker: I don't think instrumental grime has taken over the vocal side, as such, I just think it’s more a case of the artists, DJs and producers taking their craft much more seriously and doing things more professionally. TWU: A lot of people have compared you to Labrinth. That’s a pretty good look, but what are your thoughts on the comparison? Darq E Freaker: I take it as a compliment, because Labrinth is an awesome producer. I would imagine people compare the outlandishness and obscurity of what my sound is to Labrinth, but it's because it's a new sound of a certain level they're not familiar with and have nothing to tandem it with, so they will familiarise it with what subliminally seems the closest to home. TWU: What does the future hold for Darq E Freaker? Darq E Freaker: Progression, growth and collaborations. I don't like to say too much on what the future holds because nothing is ever promised, but I'll let you in on a little secret: I've done a track with one of XXL Magazine’s Freshman Class members and one of SPIN Magazine’s top hip-hop artists – American rapper, Danny Brown! Apart from that, I can only tell you to stay tuned to find out more.